We celebrate local individuals and businesses making a difference. 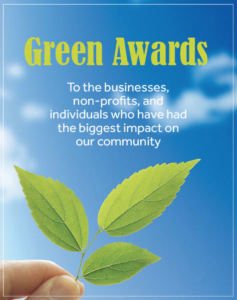 Our Green Awards recognize businesses, non-profits, and individuals that are leading the local fight to protect the environment while also creating a sustainable social and economic community. We have among us a great diversity of talented and dedicated people who contribute their time, skills, and resources to improve our unique and very special communities. We recognize and celebrate these individuals.